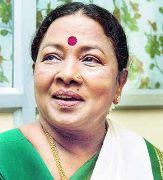 Manorama (26 May 1943, Pallathur, Tamil Nadu, India), fondly called Aachi, is a Tamil actress who has acted in more than 1500 films, 100 stage performances, and a few television serials. She has started her acting career as a drama artist, which was more popular those days. She slowly migrated from dramas to cinemas just as most actors did those days. During her initial days in the cine field, she concentrated more on comedy. She was given equally challenging roles alongside the well known comedian Nagesh. They made an excellent pair and gave many praiseworthy comedies. Her role in Thillana Mohanambal was much appreciated and noticed even with the presence of great stalwarts like Sivaji Ganesan and Natiya Peroli (Danseuse) Padmini in the movie. Ever since, she was provided with more scope in varied roles in addition to comedy. She took each responsibility with such an ease which made the Tamil industry recognize her immense talent. She has the distinction of having acted with five chief ministers of South India. She was the female lead in the stage plays written, directed and acted by Mr C. N. Annadurai, former Chief Minister of Tamil Nadu. She has also acted in stage plays with another Chief Minister of Tamil Nadu, Dr M Karunanidhi. She has acted in films with Dr M G Ramachandran and Dr Jayalalitha Jayaram who both became Chief Ministers of Tamil Nadu later. She has also acted in Telugu films with Dr N T Rama Rao, who became the Chief Minister of Andhra Pradesh. She has also obtained the Guinness World Record for acting in the maximum number of movies [More than 1500]. And she got the Indian National award for the best supporting actress for the film Puthiya Pathai – 1988.